The Palais Garnier in Paris is most commonly known as the Paris Opera, and is generally considered to be one of the most important buildings in Paris. It is centrally placed just a short distance from the Louvre. This 2,200 seat opera house was the successor to the Théâtre de l'Académie Royale de Musique, which had burned down in 1873. This landmark is a prime example of the Beaux-Arts architecture movement, in part drawing on the 17th century Classical Roman and Baroque style of emphasizing drama and grandeur as well as symmetry. 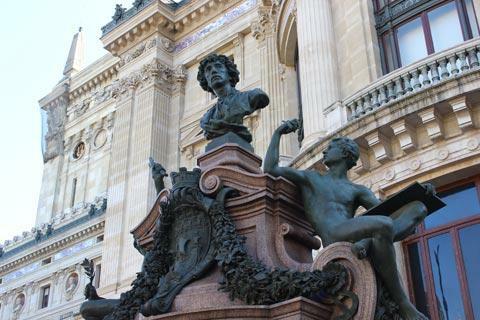 The Palais Garnier was commissioned during the reconstruction of central Paris by Napoleon III, and the civic planner Baron Haussmann was given the task to clear enough land to build the opera house in 1858. The design, by architect Charles Garnier, was chosen from a competition held in 1861. The building was always designed to be an extravagant experience, with a lush, richly decorated space incorporating excessive elements such as a six-ton central chandelier, bronze busts of composers, and multiple columns, friezes and statues. The enormous stage could accommodate up to 450 people at one time, and even the building’s corridors and stairwells are cavernous. Construction began in 1862, and was quickly plagued with setbacks and delays. It turned out that the building's foundation had unwittingly been laid upon a swamp, which took roughly eight months to drain. Then the Franco-Prussian War and the subsequent fall of Napoleon III also caused long interruptions between construction periods. It wasn’t until the Théâtre de l'Académie Royale de Musique (1821 – 1873) burned down that there was a renewed impetus that finally gave Garnier a chance to finish the work, and he did so by the end of 1874. 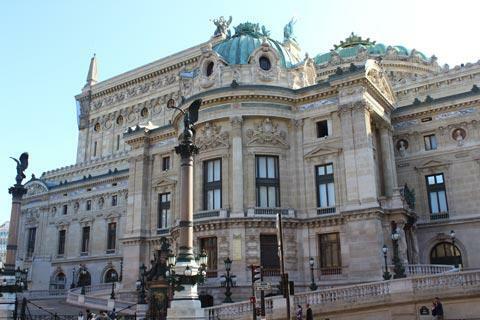 The Palais Garnier was inaugurated on January 15, 1875. 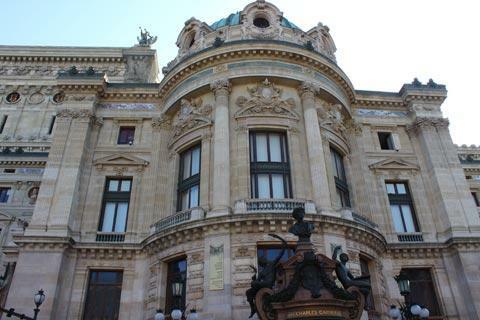 The name Palais Garnier is only a recent title – by the time it was renamed as such in 1989 it had gone through two other names. Its first was Académie Nationale de Musique - Théâtre de l'Opéra until 1978 when it was renamed as the Théâtre National de l'Opéra de Paris. 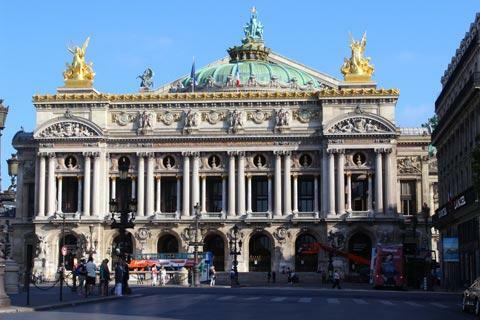 Palais Garnier became the official name when the Opéra Bastille was built in 1989 to replace the older opera house, although the Palais Garnier still remains and continues to house performances, and many Parisians still refer to the building as the Paris Opera. 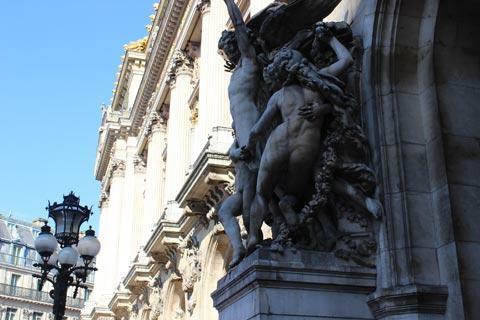 The most impressive way to approach the Opera is along the Avenue de l'Opéra from the Louvre. You can see the facade of the Opera building from all along this avenue, and it just gets more impressive the closer you get. First you will want to walk all around the building admiring its detail from the outside: there is a whole mix of architectural styles from Ancient Greek to Baroque and Renaissance as well as a great deal of statuary and ornamentation to be seen. The entrance to see the interior is to the left of the main entrance, and tickets cost about 11 euros. 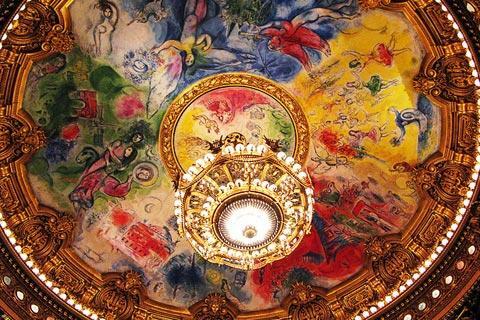 The inside of the Paris Opera was always designed to be a vast and glittering space, and it doesn't disappoint. Almost every interior surface is of marble and other impressive stonework, or gilded and frescoed. Magnificent staircases lead between the principal rooms and numerous statues and candelabras add further to the opulence. One unexpected surprise is the main hall, with a ceiling painted by the modern artist Marc Chagall in 1964 and an interesting contrast to the 19th century excesses. 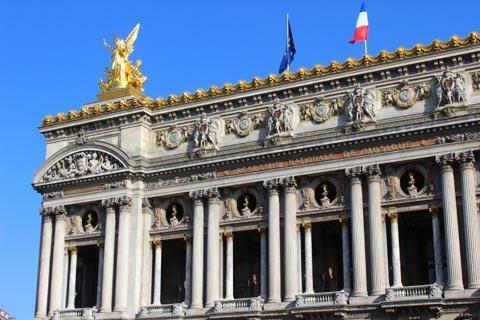 Although the Bastille is now the official home to opera in Paris, performances are often still held here with starting prices for tickets of around 150 euros.